GET ON THAT BIKE AND RIDE LIKE YOU STOLE IT…. WHEN: Wednesday “Rock” with Alex at 18pm or Thursday “Techno” with Malin at 19pm. WHERE: ride. bln Mitte, Schützenstraße 70, 10117 Berlin. (ride bln. is also in Charlottenburg). THE DEAL: A studio dedicated to spin. Get your natural high on a bike here with an intense ride class surrounded by positive people. The studio themes their classes around the music - the rock and techno nights are our favourites. This way you can party with your friends twice - once on a bike and then to Berghain. 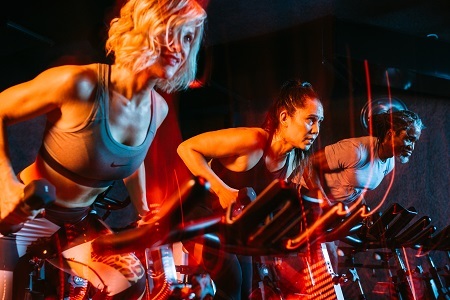 THE WORKOUT: If riding in candlelight to music - techno, house, pop, rock - with some of the most pumped up instructors we’ve met sounds like your jam then come here. As soon as you walk through the door you feel like one of the tribe. Staff are super friendly and all the necessities are taken care of (shoes, water, towel and bike set-up). Even if you’re a seasoned spinner this class is hard. It’s 50 minutes of high-intensity interval training on the bike - with barely a break between tracks. At ride bln. there isn’t a speed, distance or resistance dial you can keep track of. The focus is on heart-pumping cardio intensity but the class style integrates upper body work in as much as legs. 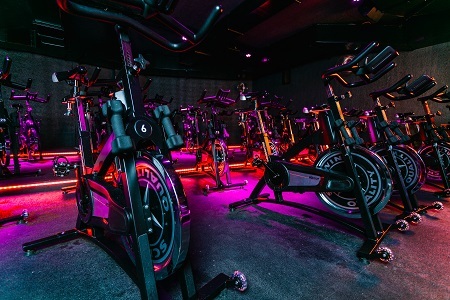 In every track you’ll move out of the saddle, back in the saddle, press up and down at various tempos on the bike, take your arms up, arms behind and move side-to-side - non-stop. You won’t give up (you’ll want to - its going to burn) because the instructors are there shouting positive affirmations and lifting up the class like some kind of spiritual spinning god. With the candles involved and arms up you feel part of some kind of religion. There’s also an upper body weights track in every class - an addition which we loved (plus it means your legs get a well needed break). Hobble out of class and get greeted by a eucalyptus infused cold towel to wipe the hard-earned sweat of your face (a nice touch). The changing rooms are stocked with all the luxuries; REN products, deodorant, moisturised, hairy dryers and straighteners. The only downside is that the changing rooms are on the small side so after a packed class you may have to wait a while to get into one of three showers. THE PRICE: First-timers pay €39 and get three classes. After that its €24 for a drop-in. Also keep an eye out for the free introductory sessions that run every month. Urban Sports Clubbers are welcome.